Every year The Millions has a feature called “A Year in Reading” that I really enjoy. Throughout the month of December, they publish a bunch of short little articles where people of note (most of them writers, but other kinds of people are mixed in as well) talk about the best books they read in the past year. This is not the same as a “Best Books of the Year” list (there are lots of those too, which are of course interesting – Salon had one recently that was also by writers), because the contributors write about the best books they read in the year, even if they were not published in the past year. So you have a nice mix of old and new, and it is nice to see how the books that came out this year stack up against other books rather than just against other books that came out this year. I like seeing what other people have been reading, especially when they themselves are writers that I like to read. For example, this year I read A Visit from the Good Squad by Jennifer Egan, so it was cool to see what she read this year. Anyway, it made me think back on my year in reading, and I thought I would share some of the highlights. There were many. 2011 has been a good year. There were a lot of firsts for me this year, but the one that stands out the most was my first encounter with Jorge Luis Borges. I read Labyrinths: Selected Stories and Other Writings for the first time (shamefully it has been sitting on my shelf for years), and I was totally absorbed by it. I was literally transfixed, as in my limbs fell asleep while I was reading (I have strange, inexplicable reading-posture) on numerous occasions, and I didn’t even notice it until I tried to get up. I wish I would have read Borges earlier, but then I think, Maybe if I had I would have written a book that, over time, started to write me, and instead of stopping, I would have continued until the last page. Then I would have been trapped inside the book, staring out at my fictional creator. If you think this scenario sounds far-fetched, then you have not read Labyrinths yet, and you should go do so now. I also read The Possessed: Adventures with Russian Books and the People Who Read Them by Elif Batuman (who, by the way, keeps an awesome blog – she is really funny). This book was the first among many this year that, slowly, restored my confidence in non-fiction. Of course this book is about literature, kind of, but it is also kind of a memoir and kind of full of essays. In short, it is really cool, and helped me realize that you can (and should) write about whatever you are interested in, even if they don’t seem to go together. And you should be funny. If you can pull it off. Recommended. I started and ended 2011 with one of my all time favorites: Milan Kundera. Early on I read Testaments Betrayed: Essay in Nine Parts, which had a big impact on the rest of my year (more on that in a second), and I recently finished Encounter: Essays. I think I am finally comfortable saying that I enjoy Kundera’s non-fiction better than his novels (I think), and that is really saying something, because in college, I seriously was Jaromil (although my militancy was less pronounced, and my verse was probably a lot worse), until I read Life is Elsewhere. At that point I became a self-aware Jaromil. I love Kundera’s novels, but at times they can be unbearable light (sorry) in a good way. Kundera refuses to write fiction that is “about” something. Fiction that is grounded or arguing a point. He defends the right of the novel to be light, funny and irreverent. When he writes about fiction, however, you can tell he is digging in his heels and defending something that he cares passionately about, and I think I like it better. But really, its like choosing a favorite child. Actually what I love best is somewhere in between his fiction and non-fiction, when he includes “essayistic digressions” in his novels. Like all good digressions, they lead you away from what you should be concentrating on, to what you need to be concentrating on. The biggest thing Kafka taught me this year was restraint. He used it to give power to ordinary objects, like a file, or a window, or a Castle. The Castle is a good example – he never once describes the Castle, that eponymous object of desire that his protagonist is constantly trying to reach. Well, he does describe it once, in the beginning, from a distance. But that is it. And the protagonist? He doesn’t even get a name. Just a letter. Are you kidding me! Kafka restrained himself from giving details (anyone who writes knows the temptation), and by holding himself back, he was able to infuse his fiction with an epic, timeless quality. It is almost biblical (The Trial = The Book of Job), and it is awesome. 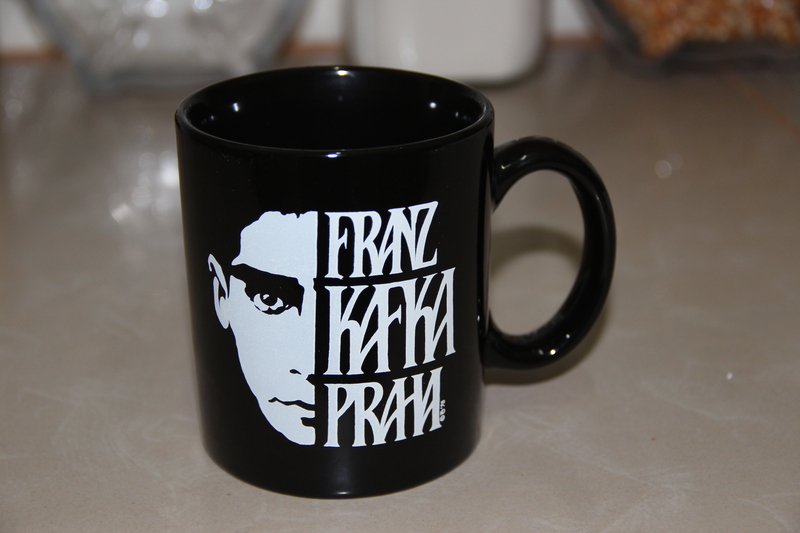 Speaking of restraint – I have to admit, I did buy a Kafka mug at the airport gift shop. I hate tourists! "One morning, Gregor Samsa woke up and found himself commodified and transformed into a shameless piece of kitsch." The rest is not worth mentioning, really. One that I read last year was Three Cups of Tea by Greg Mortenson, really liked that one about how he started building schools in Pakistan after getting lost on his way down from 2K. Maybe I could read Borjes in Spanish. I’ve had to write a summaryof my thesis in Spanish, and I realise how difficult that is for me since I’ve never even studied Spanish in an academic setting. Reading would probably help. Thanks, and thanks for sharing your list. I also love biographies, and I wish I could read Borges in Spanish, I am sure a lot is lost in translation. Best last line of a post EVER. That Gregor Samsa… what an unlucky dude. My year is pretty much the opposite of yours: the only fiction I read was 100% children’s lit (and most of that — George McDonald), and the rest of my year was filled up with the obscure but fantastic Maurice Blondel (his magnum opus “L’Action” and his lesser known “History and Dogma”), and the not so obscure but completely impenetrable Heidegger (“Being and Time”). Everything else escapes me now. But say, have you ever read The Lord of the Rings? YES? Oh, that’s right. By the way, I’m not sure if I ever told you this, but your LOTR poem was amazing. We had to leave the book in NC because of weight allowance issues, but I can’t wait to read it again. Thanks Nomi. Yeah I guess you could read a lot of different books all year, or you could just read Heidegger. I do miss school, but one thing that is nice about not being in school (in the non-Heideggarian sense), is the freedom to read whatever you want. Of course, were it not for school, I probably wouldn’t have known what I want to read in the first place. Are you guys super pumped about the Hobbit? Oh wait, silly question.